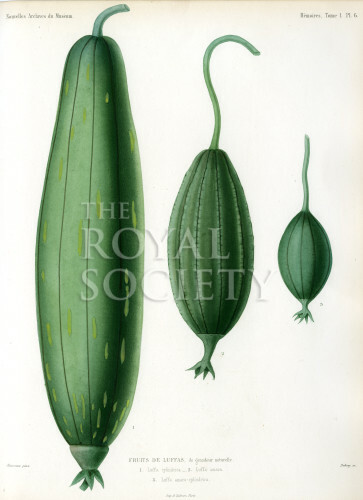 Botanical studies of the fruits of the Sponge gourd Luffa aegyptiaca,(here styled Luffa cylindrica) and the Ridged gourd Luffa acutangula (here styled Luffa amara). With a hybrid Luffa amaro-cylindrica.Three figures. Plate 6 accompanying the paper ‘Nouvelles recherches sur l’hybridité dams les végétaux’, by Charles Naudin, Nouvelles archives du Muséum d’Histoire Naturelle…’ v.1 (Paris, 1865) pp.25-176. Charles Victor Naudin (1815-1899) French botanist and pioneer of selection studies in plant-breeding.